Mona B. Lucca Mini Crossbody at P. C. Fallon Co. The Lucca Mini Crossbody Bag by Mona B. is a statement-making accessory. Made from upcycled canvas materials that have been cleaned and re-purposed, Lucca is unique and earth-friendly. 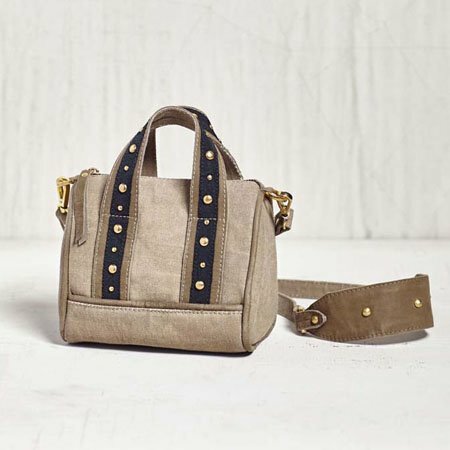 The petite bag has adorable heavy canvas handles trimmed with black grosgrain ribbon and brass rivets. Lucca also has a detachable canvas and leather crossbody strap with a 25" drop for versatile use as a handbag or as a crossbody bag. The subtle olive green color of the canvas and olive green leather creates a neutral backdrop for the contrasting black ribbon accents. Zippered closure with a leather zipper pull for secure access at the top of the bag. The interior is lined with the signature Mona B. cotton lining and contains 2 open pockets. Dimensions are 7”w x 6.5”h x 4.5”d. Made from recycled antique military tents and tarps. The fabric shows the history of its travels. Color variations and patches add to the uniqueness of each bag. Heavy cotton canvas trimmed with leather.